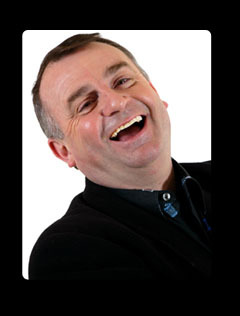 Mark Banks has been in the comedy business for over 25 years. He claims that at the age of 11 he was able to “balance an entire Zulu rondavel and its content on his chin while singing I’d Like to Teach the World To Sing”. Mark writes and performs his own comedy shows and material, he is passionate about his comedy work. In Mark Banks’ spare time he runs an organic, hydroponic cocktail cucumber farm in Swellendam. He quotes “It’s grown only on a prayer”. Mark Banks works as a Master of Ceremonies (MC) for any type of award ceremonies, corporate functions, banquets and conferences. He has represented South Africa in the 1996 “Just for Laughs” Comedy Festival in Montreal. Mark has been praised and reviewed by critics for his comedy for many years of which he has a tendency to thrive on them which makes him even better than before. Mark Banks claims that his “We’re Not On Top…. We’re Inside”, won the prestigious Epol Late Entry Award at Gilooly’s Farm Dog Show. Mark has appeared on television regularly and has been a presenter and has been interviewed and has featured in several advertisements. Mark has also done a one-man comedy show that included a smart and brilliant title “Eks ‘n Doos van Suid-Afrika” which jabs at the locals living abroad. He has also done a lot of missionary work for the hearing-impaired, disabled and old-aged people. His most recent accolade was being one of the cast who performed with the Bafunny Bafunny tour at the Royal Albert Hall in London in May 2010 which was then brought home to South Africa. Mark Banks’ other interests lie in writing about the strangest of subjects. Eg. “A to Z compilation book of the lemurs of Madagascar” for visitors to Cape Town, “training a coelacanth to leap through a hoop of crusty bread rolls” and “completing a volume works on Chinchilla Respiratory Tract Infections”. Mark Banks is an accomplished comedian who grows from strength to strength.